The Acura NSX hybrid supercar concept has been drawing large crowds and lots of interest ever since its 2012 NAIAS debut, Super Bowl ads and Mid-Ohio performance preview, along with video teasers confirming the car as a viable prototype. This week, the svelte beauty will grace the Concept Lawn at Pebble Beach on August 18, marking Acura’s emergence as an Official Sponsor of the 2013 Pebble Beach Concours d'Elegance. As one of the world’s premiere exhibitions of exotic and luxury vehicles, the Pebble Beach Concours d'Elegance is sure to draw a large crowd of highly appreciative admirers – in short, the Acura supercar will be immersed in its element. “We are thrilled to align the Acura Brand with this prestigious event that is the ultimate celebration of the automobile," said Michael Accavitti, senior vice president of Automobile Operations at American Honda Motor Company, Inc. The production model based on the NSX Concept is in development by engineers at Honda R&D Americas, Inc, in Raymond OH. The evolution of the Acura sports car will take place in nearby Marysville, in Honda’s new state-of-the-art Performance Manufacturing Center, currently under construction. 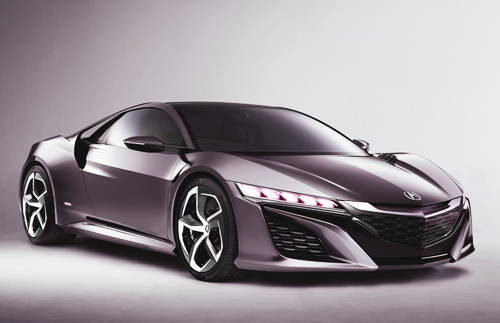 The production model of the Acura NSX is slated for sale in 2015. Targeting the dynamic capabilities of a supercar for a new century that combines thrilling performance with environmental friendliness, the NSX will be powered by a mid-mounted, direct-injected V-6 engine tied to Acura's Sport Hybrid Super Handling All-Wheel Drive system (SH-AWD). This moniker refers to a three-motor high-performance hybrid system combining torque vectoring and hybrid efficiency via the three electric motor approach. One motor is part of the V-6 engine using a dual-clutch transmission to jointly drive the rear wheels. Two additional motors drive the front wheels, thus enabling split-second delivery of negative or positive torque during cornering to produce a new level of handling that outstrips current AWD systems. “This change in torque at the wheels will help the NSX to corner at a higher rate of speed compared to a conventional rear drive sports car,” said Chuck Schifsky, PR Manager for Honda USA, when asked about this system. “The original NSX delivered a new kind of sports car experience to buyers when it went on sale in 1990. We are fully committed to doing the same thing this time around,” he continued. “The new NSX is being developed under the theme of the synergy between man and machine, as Ted Klaus, the chief engineer of the NSX has said. It's the idea that every component on the car and the car itself as a whole is designed to be in perfect harmony with the driver's desires. There will be no wasted motion or effort in terms of both building the car (the goal is the build a highly efficient plant for NSX production) or driving it. The NSX Concept that will be on display at Pebble Beach has the same basic styling as the one that lapped the Mid-Ohio Sports Car Course in Lexington, before the Honda Indy 200 race. It features the blue graphics foreshadowing Acura’s intention to take the new car to the racing world. Next Sunday would be a nice time to be in Pebble Beach, would it not?